Sacramento State’s Division of Criminal Justice (CJ) is golden this year, celebrating its 50th anniversary. Judge Consuelo M. Callahan, of the U.S. Court of Appeals for the Ninth Circuit, is the keynote speaker, and Beth Ruyak, host of Insight on Capital Public Radio, will emcee. Highlights include dinner, a jazz band, and a silent auction to support CJ student scholarships and faculty professional development. In addition, the division will auction a copy of the newly published 50th anniversary textbook, Critical Issues in Criminal Justice: Historical Perspectives (Cognella, 356 pages), edited by CJ faculty Ryan Getty, Jennifer Noble, Mercedes Valadez, and Ernest Uwazie. More than a dozen current and past faculty and alumni contributed chapters to the book. 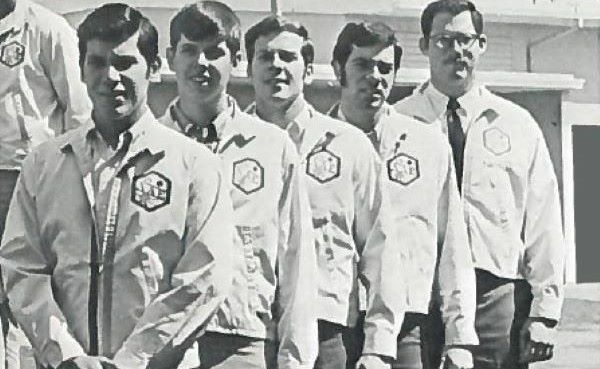 Charles Bell ’71 (Police Science), ’73, (CJ). Former chief sergeant-at-arms for the California State Assembly and member of the Sac State Football Hall of Fame (running back, 1968-70). Suzanne Collins ’86 (CJ). Field representative for the California Board of State and Community Corrections and former assistant chief probation officer for the Sacramento County Probation Department. Joseph Gutheinz ’78, ’79 (CJ). Partner in Gutheinz Law Firm, LLP, in Friendswood, Texas, and former Army intelligence officer and senior special agent for NASA’s Office of Inspector General. David Taylor Harper ’87 (CJ). Inspector general for the Florida State Department of Financial Services and former special agent-in-charge of the Air Force Office of Special Investigations. Eric Jones '93 (CJ). Chief of the Stockton Police Department and chair of the California Police Chiefs Association’s evidence-based policing working group. Valerian “Val” Kobza ’60 (Public Administration-Law Enforcement). Retired Sacramento County Sheriff’s chief deputy and executive director of the Northern California Peace Officers Association’s scholarship foundation. Rob Patton ’90 (CJ). Works out of the Rancho Cordova Police Department/East Bureau of the Sacramento County Sheriff’s Department and chairs the Sheriff’s Leadership Program. Lionel Rawlins ’92, ’94 (CJ). Associate professor of criminal justice and assistant vice president for safety and security at the American University of Nigeria. Michael Santarosa ’02 (CJ). Judicial services officer for Sacramento County Superior Court and U.S. Army Reserves judge advocate general. The division kicked off its 50th anniversary celebration in October 2018 with a talk by Shaka Senghor, criminal justice reform advocate and author of Writing my Wrongs: Life, Death and Redemption in an American Prison. A highlight of the “50th Anniversary Week” in March was the appearance David Howard, author of Chasing Phil: The Adventures of Two Undercover Agents with the World’s Most Charming Con Man. Joining him for a chat and book-signing were James J. Wedick (now a Sacramento resident) and Jack Brennan. They were the young, inexperienced FBI agents assigned to bring in the world’s greatest swindler. Robert Downey Jr. has optioned the book’s movie rights.